Once stricken with such anxiety that she didn’t want to leave home, Elena now enjoys going to her job where she is part of a team. Creative, energetic, diligent. When you see Elena Panchesin in action delivering structured activities and supervision for youth at a local elementary school, these might be some of the words you would use to describe her. You would likely have no idea how hard she has worked to get to this place. Currently, she works as a Program Leader in her position with AZ Community Enrichment, but just a few years ago, Elena, who suffers from PTSD, severe depression and anxiety, was hardly able to leave home and had a hard time doing basic things for herself. Before coming to Beacon Group, she found it difficult just to talk to people. Now, Elena works 24-30 hours a week, split shifts each day, in order to cover both before and after school programs with the CREW Club. It’s a schedule she doesn’t mind because her employment and new confidence has enabled her to start working on her future dreams, a college education. And she loves her job bringing smiles to others. Elena started working with Beacon over a year ago at age 18. 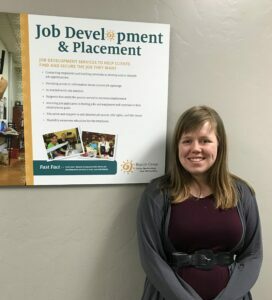 She credits multiple areas of support services as being critical to reaching her first goal of finding a good job and to launching her second goal – to attend college and be able to help others who struggle with mental illness. Her dream is to become a psychiatrist as she would like to see more and better services available for people who need assistance with mental health disorders. Elena mentions three specific ways that Beacon programs have moved her closer to her goals. First, Elena was permitted to move at a pace that worked for her. She was involved in Beacon Group’s Work Adjustment Training (WAT) Program but started slowly – working only a few hours a week. Being in large crowds with lots of noise and movement used to trigger a lot of anxiety for her. She needed time to develop tools to manage the anxiety, and WAT helped her do this. She remembers how going to work started to give her “a reason to get out.” During this time, Elena says she was also able to focus on finding the medical resources that helped her move forward with the level of care she needed. Elena credits multiple areas of support services as being critical to helping her reach her first goal of finding a good job. Finally, to prepare her for landing a job, as a program leader, she could thrive in, Elena practiced interview skills and received resume help from her Beacon advisers. Once stricken with such anxiety that she didn’t want to leave home, she now enjoys her job because she is part of a team and gets to work with kids. She likes that they are easy to be around and wants to make a difference in their lives. “I encourage them to communicate, be kinder to each other and get along better,” she says. Her advice to others? “Don’t give up. Try a new approach. Persist in finding the resources you need.” Elena expounds with all seriousness, “With mental health struggles – it’s an invisible disability – you can’t see it. You must advocate for yourself, otherwise it remains silent. If you don’t speak up you won’t be able to get the resources and help to succeed.” As another smile spreads across her face, it’s clear she has taken her own instruction.